Our office in Ashby de la Zouch is located on the busy Market Street in the centre of the town. 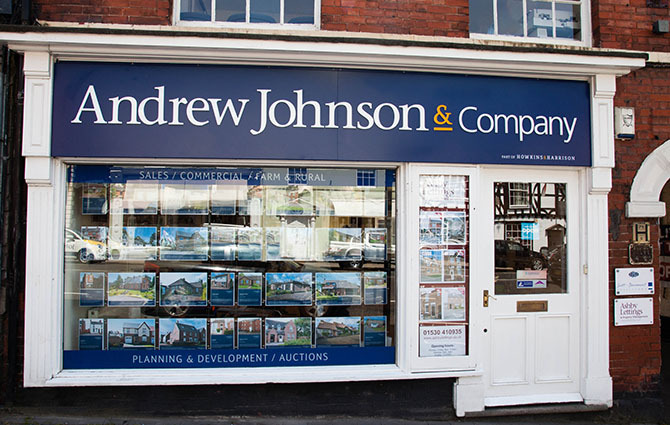 We work as Andrew Johnson & Company, Part of Howkins & Harrison in Ashby. Our team have an extensive local knowledge and work alongside our Ashby rural and commercial teams. There is metered car parking along Market Street, or there is the larger pay and display South Street Car Park, just a short walk away. If you need directions please just call the office. The town of Ashby de la Zouch, or Ashby as it is more often shortened to, is quite simply a beautifully quaint and quintessentially British market town. It has red brick houses and shops with a busy market street with a thriving mix of brand names, independent stores and boutiques. It is surrounded by thriving farm land and has a strong rural community. It is located within the National Forest, and as their website says this “is one of the country’s boldest environmental projects, transforming 200 square miles in the centre of England”. The project started 20 years ago and has been growing and developing ever since, with the aim of showing the benefits of having beautiful woodland parks where people live and work. The area boasts some great primary schools; Woodcote, Ashby CofE, Packington CofE, Willesley, and the Ofsted ‘outstanding’ rated Ashby Hill Top. Plus, two great secondary schools; Ivanhoe College and Ashby School. The remains of Ashby Castle are well worth a visit. The property started as a 12th century manor house and later gained castle status in the 15th century. Regular events, enactments and tours take place through their open season.